Portsmouth Division RMVCC is the oldest unit in the Volunteer Cadet Corps having ‘stood up’ on 14 February 1901 in Eastney, Portsmouth. The first commanding officer of the Division was Captain William Harkness RMA, now regarded as the ‘founding father’ of the VCC. Having moved from Eastney Barracks in 1991 and then again from HMS Nelson in 2001, the Portsmouth Division RMVCC is now based at HMS Excellent on Whale Island, and located next to Navy Command Headquarters. The Division has over 200 personnel on its books and is the largest of the VCC units. Cadets meet on Tuesday and Friday evenings and can also attend swimming practice on Thursday evenings and shooting lessons on Saturday mornings, all without extra charge. The cadets in Portsmouth participate in all of the usual RMC training and activities, making good use of Longmoor and Browndown training areas, as well as the New Forest and the South Downs. Our cadets will often stay out on the training areas at weekends as they are instructed in field craft, but always supervised by adults. They will learn tactics, field cooking and personal hygiene, irrespective of the weather! The cadets aren’t always in green however, and will often be looking smart on parade in their blue dress uniforms, especially in Guildhall Square on Remembrance Sunday. Like our other RMVCC Divisions, our recruits undergo basic training for about 4 to 5 months as they are introduced to drill, map reading, navigation, first aid, field craft and Corps history. The recruits’ training finishes with a weekend exercise on Longmoor where their field skills are assessed and then a Pass Out parade in front of very proud family and friends. The top recruit is awarded the prestigious Belle Isle Award. Having ‘passed out’, our cadets can join our General Duties Training or Musical Training routes. During the summer term we have display teams, one of which is our Drill Display Team. A squad of 20 cadets can put on a 15-20 minute display in ceremonial uniform showing off their dexterity with drill rifles and complicated formations, all without a word of command. The Portsmouth Division has a Field Gun display team. A team of 20 well trained cadets compete against other cadet units, including HMS Collingwood and HMS Sultan cadets, in a 100 yard race with an original Boer War 7 pounder muzzle loading Field Gun. The gun weighs over a third of a ton and each wheel weighs about 70 pounds, the same weight as a small cadet! 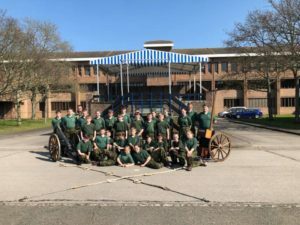 Having also appeared at the Royal Tournament and more recently at the Kirkcudbright Tattoo, our cadet Field Gun is an exciting display of enthusiasm, fitness, discipline and teamwork. 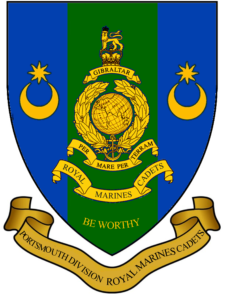 See more about our activities in public here or read Welcome to the Challenge!, our guide to being a Royal Marines Cadet in Portsmouth. Address: Portsmouth Division RMVCC, Alamein Block, HMS Excellent, Whale Island, Portsmouth, Hampshire, PO2 8ER. Fitness Club: Wednesday evenings from 1830 to 2000. Commanding Officer: WO1 Oliver Seebohm RMC. Training Officer: CSgt Chris Edwarss RMC. Health & Safety Officer: CSgt Russell Chisnall RMC. Finance Officer: Mrs Tina Hinchliffe.